Indian spinner Yuzvendra Chahal always punches above his weight. He has had some incredible moments representing the blues. The men in blue are currently in Australia to take part in a series of three T20Is; which will be followed by the Test series and later the ODIs. The players are sweating it out at the gym and in the field to bring out their best in crunch situation. The current crop of cricketers are well aware of the value of fitness and they get rich results more often than not. The likes of skipper Virat Kohli and Rohit Sharma can be seen flexing muscles in during the work out session. It shouldn’t come as a surprise when spinner Chahal gets his session going. Chahal posted a video on instagram, where he can be seen spending quality time in the gym. He captioned the picture “Trying to UP the game down under #stayahead #indiavsaus. The clip as usual became a hit and fans were quick to praise the cricketer. 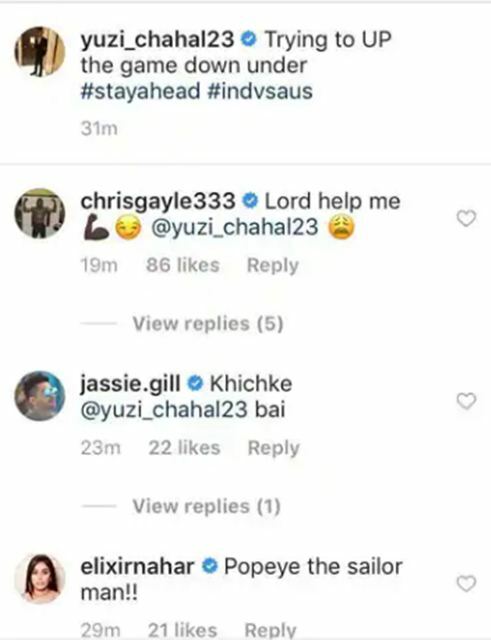 It all became quite hilarious when Chahal’s ex-teammate from RCB- Chris Gayle commented on the post. The Jamaican dasher commented, ” Lord, help me”. Gayle’s reaction clearly broke the internet and moreover Chahal was found at the receiving end. Chahal is a vital cog in the Indian team. Kohli’s men are having a great year. They have won almost every limited overs event and stamped their authority. The spinner was quite vocal about the team culture. “This Indian team is a family. The seniors have made sure that none of the young players feel overawed by the names in the dressing room. You can walk up to anybody and tell them what you feel about a certain situation. Be it Kohli bhai, Rohit bhai or MS bhai. They are the elder brothers to the youngsters in the team,” Yuzvendra Chahal told Hindustan Times.